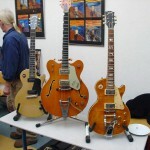 The Vintage Guitar Show in Oldenburg/Germany celebrated their 25th anniversary. thread in the les paul forum. 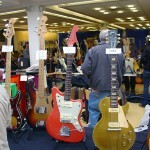 The Vintage Guitar Show in Oldenburg has a fixed date in my personal schedule for many years. 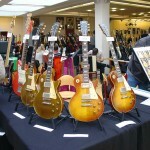 The guitar show is one of the biggest in Germany and has a very relaxed atmosphere. 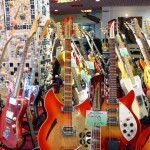 This year were over 500 guitars, basses and amplifiers on display with a rate of 25% what I call proper vintage (before 1970). 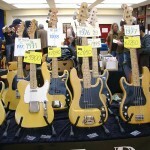 My personal opinion is that the general asking prices were too high, not reflecting the economic situation in the USA and the actual prices for vintage guitars in the United States (even if you consider additional 23% tax etc.). My estimation comes from monitoring the actual prices of guitars that sold through ebay and not the asking prices in sites like gbase. 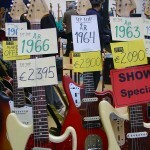 I could not say how many guitars were sold and at what prices, but some of the guitars were already on offer last year. 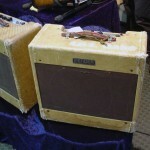 The two biggest booths were from the Oldenburger Music-Station with a nice selection of fender and gibson gear, especially a lot of fender basses from the 60ties and 70ties and from the Swedish dealer tiptop. 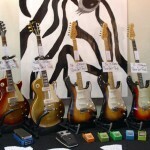 Tom Wittrock and Bernd Groll had some very nice 50ties vintage les paul’s on display. 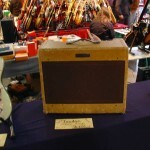 What I personally missed was the booth of ludo stoelen who has always a large selection of vintage fender guitars for sale. A played Fender Stratocaster in olympic white (i would say blond) with an ash body and a slabboard from 1962 asking in the 22.000 Euro range. 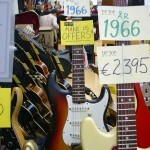 A 59 maple neck strat asking 20.000 Euro. A really rocked 57 hardtail strat with some parts changed asking 14.900 Euro. A 52 les paul goldtop asking 11.000 Euro. A very clean gibson les paul special from 1958 asking 7.600 Euro. A very nice Gibson Es 335 from 1966 with a bigsby asking 5.890 Euro. A very rare gibson flying V medallion from 1971 asking 5.300 Euro. A stripped and routed fender telecaster from 1967 for 2.850 Euro, a rare fender telecaster thinline type 1 from 1971 in black with a conversion to a neck humbucker asking also 2.850 Euro and a nice 66 gibson ES 335 with a conversion to a stop tailpiece for 3.950 Euro. 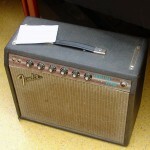 I wonder were are all the blackface vibrolux reverb amps gone? My conclusion of the show – see you next year in OLDENBURG. This entry was posted in guitar shows on 22. November 2010 by admin.